We’re in the middle of one of the worst heatwaves we’ve experienced ever since we moved out to Parkdale, OR five years ago. Taylor and I have farmed in some pretty extreme conditions before. On the east coast it was August days spent harvesting thousands of pounds of food on 100 degree days with 100% humidity (with a 100% chance of 100 mosquito bites to top it off). We’ve harvested for the farmers market in the snow before and have weathered a few hail and wind storms to fill in the gaps. However, this year feels more extreme for some reason. Maybe we’re just getting older and can’t tough it out as well as we once did but damn, it’s been brutal out there! We’re in the thick of extreme weather–we haven’t had a drop of rain in months and the stress of keeping the irrigation going, moving lines every few hours, has almost been crippling. The heat not only takes its toll on the newly transplanted crops, but we’re moving slowly out in the fields which adds up to an even longer day as chores are taking longer. There’s not much we can do but keep putting one foot in front of the other, hydrate like crazy, and continue to take care of the crops that we’re counting on to take care of us and our members for the rest of the season. It’s stressful alright, but that’s farming and in the end, it’s what we choose to spend our days doing so we really can’t complain. I just want folks to recognize that growing food isn’t all that glamorous and if you aren’t careful, the workload and stress will eat you up. In an effort to keep our bodies nourished during this heatwave we’ve turned to my favorite kitchen tool (or rather non-kitchen too) our outdoor grill! I cannot tell you how much I have fallen in love (all over again that is!) with our grill. It’s too damn hot to turn the stove or oven on so cooking our meals over an open flame is absolutely wonderful this time of the year. This recipe for squash steaks is a great way to use up the overwhelming amount of zucchini/squash that’s popping up at the farmers market and CSA boxes every week. Now I know what you’re thinking….squash steaks? The term actually refers to how the squash is cut and prepared (just like a steak) and isn’t actually trying to stand in for a true steak. And in fact, I think if we do this again these squash steaks would taste equally good layered on top of a grilled rib eye. I’ll report back if we do that! Anyhow, we served our “steaks” with a lovely peanut-miso sauce and a cabbage slaw for a perfectly light and refreshing summertime meal. Enjoy with an ice cold beer or glass of crisp white wine for a simple dinner. In a large bowl, toss the cabbage with the lime juice, sesame oil and salt. Set aside. Preheat and outdoor grill for medium-high heat. Brush the squash halves with a little olive oil and sprinkle them with salt and pepper. While the grill heats up prepare your sauce. Using an immersion blender or small food processor blend together all the ingredients for the sauce until smooth and creamy. Taste for seasonings and adjust as needed. If the sauce is too thick add a touch more water to thin until you reach your desired consistency. Place the squash cut side down on the preheated grill and cook until char marks appear and the squash is tender, about 3 minutes per side. Divide the cabbage slaw between plates and top with 1 or 2 of the grilled squash steaks. Drizzle with the sauce and serve with the roasted peanuts and minced cilantro. Why haven’t I thought of squash steaks as a replacement for meat steak before? Sounds wonderful! I appreciate and am thankful for all of your hard work. This recipe looks and sounds like a delicious way to use zucchini (or summer squash). Thanks for taking the time to share it! Hi – I have recently subscribed. Really get it about growing food. I have a small (very small) backyard farm in Vancouver BC on a 39 foot lot. We are also having a heat wave….yes I guess most folks haven’t a clue how much care and attention and sweat goes into growing. But there is also, as you say, satisfaction in knowing you are doing whatever you can. Plus there is the physical labour which is so good for body and soul…. 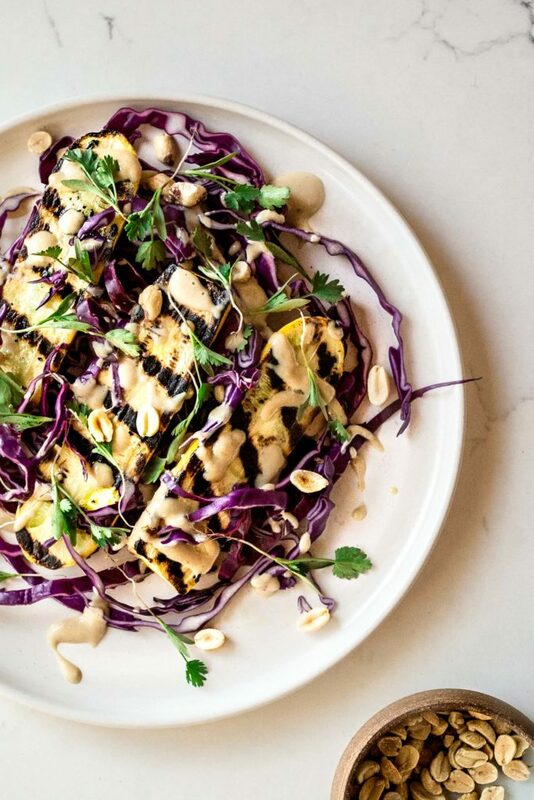 Loving the sound of that Peanut Miso Sauce… you certainly have a way with sauce. And totally in love with the DUTD Cookbook everything I’ve made has been so delicious. Sending cool thoughts from Australia! Made this on Saturday and it was wonderful! I generally don’t even like yellow squash, but it was a hit.